Last month I showed you how I tracked and photographed the Super Moon. I was not very happy with the attempt. One of the reasons why I wanted to take the Night Photography eClass. This week’s assignment was to photograph the Moon as it rose the night before the full moon. The weather which caused havoc all across the United States last weekend put those plans on hold. Using what I learned, I did take this photo last Friday night of the gibbous moon which was around 90% Full. The Waxing Gibbous Moon. Nikon D700/80-400VR, 1/125s, f/11, ISO 200, EV +0.3, 400mm focal length, tripod. This time I used the Nikon D700 digital SLR camera coupled with the Nikon 80-400mm VR Zoom lens to photograph the moon. Though I lost 200mm in reach not using a cropped camera, the resolving power of the larger 12MP sensor in the D700 made up for it. The fact that I was not guessing at the exposure this time helped the most. This photo is much better and shows the moon’s surface features as it floated above me. I hope to get the moon rise or set later this year. This entry was posted in Weekly View and tagged 80-400mm, astronomy, baldwinsville, gibbous, moon, new york, nikon D700, satellite, tripod, vr, waxing. Bookmark the permalink. Fantastic shot Scott, love it! It’s perfectly amazing to me that your camera–in your hands–is able to show me almost as much detail as the telescope can. I rather like the little mystery left in this phase. Why, thank you so much, Gerry! It’s good but nowhere near as good as a true astrophotography setup would be. I’m with you, I do like this phase to as you get some shading. I want to try other phases which changes the exposure but should be even more dramatic looking. Nicely done, Scott. You are learning much in your class! Yes, I am. The stars are next if the weather will cooperate. The presentation of the information is excellent. Will go into more detail when I finish both courses and write up a review. Was the moon low on the horizon? That’s a tough shot with the atmospheric conditions which caused the coloration. Awesome! Great detail in this shot. You are too kind, Kathy. Thank you. This is just the kind of moon shot I’d love to be able to take. Beautiful work. Usually once a month, I’ve been seeing a perfect “Cheshire Cat” moon – a really neat crooked smile of a moon, sometimes just perfectly misted with clouds to a look as though it is disappearing. I’m dying to photograph it; do you think similar settings to yours could help me out? A crescent moon is what you are describing with a lot less reflected light. Make sure you use spot metering. Open up the aperture and/or raise the ISO to keep the shutter speed around 1/30th of a second or better for best results. Done right indeed! Nice work. Thanks, Mike. Now all I need is a snow capped mountain peak to go with it. Got any you can ship down here for me? I couldn’t photograph the moon the night before or the night of the full moon due to clouds. I’m looking forward to getting it next month. Hi, Mary! I noticed you were taking the class. How do you like it so far? Will you be doing the second one, too? Impressive shot, Scott. The detail is amazing. This is a wonderful image – amazing what an excellent photo equipment and a skilled photographer can produce! What!! You took this?!? Scott, I am usually impressed by your images but this one takes the cake. 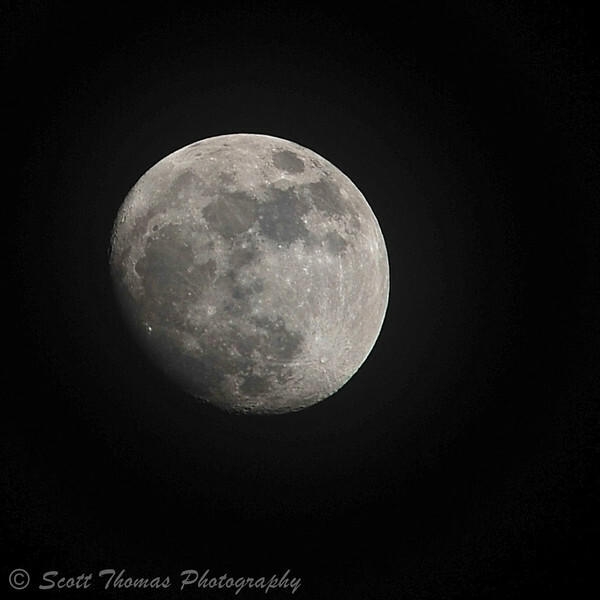 Fantastic moon shot, Scott! The detail is amazing.